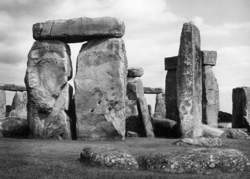 , group of standing stones on Salisbury Plain, Wiltshire, S England. Preeminent among megalithic monuments in the British Isles, it is similar to an older and larger monument at Avebury, some 20 mi (30 km) away. ..... Click the link for more information. , the best-known megalithic monument in Britain, Durrington Walls, and many other Neolithic remains are nearby. Whittier received a scanty education but read widely. 1729–95, political leader in the American Revolution, signer of the Declaration of Independence, b. Amesbury, Mass. He practiced medicine in Kingston, N.H.
..... Click the link for more information. was born in Amesbury. Amesbury, an important site of Arthurian legends, is near the pre-Christian site of Stonehenge. Fortean Picture Library. The town of Amesbury, located about eighty miles west of London, England, lies in an area of ancient and continued holiness. Nearby, on the Salisbury Plain in Wiltshire, is Stonehenge, one of the most ancient megalithic structures. A little to the north is the Avebury stone circle, scene of a religious tradition going back some four thousand years. Welsh historians believe that during the Middle Ages, a monastery was located in Amesbury, but a consensus seems to have developed that in the time of Ambrosias Aurelianus, uncle to the fabled King Arthur, it was a garrison for troops, and the place was named Ambrosiani after Ambrosias. Anon I made profession, and took vows As nun encloistered: I became Christ's spouse, At Amesbury, as Abbess to the house. I changed my ermines for a goathair stole, I broke my beauty there, with dule and dole, But love remained a flame within my soul. Thus at Amesbury we find a curious but fairly common occurrence. One religious tradition, in this case the stone-building culture of prehistorical Stonehenge, is superseded by a completely different religious tradition. In this case, it is the legend of King Arthur's court and the search for the grail from Christ's last supper—the legend marking the transition from paganism to Christianity. to an Amesbury Street address for a report of a home invasion in progress. A pair of engineering and product development companies and their principals sued Edina window hardware manufacturer Amesbury Group, Inc.
Arthur White Brother of Edmonston White, of 57 Amesbury Road. NEIGHBOURS KILLED ON THE BATTLEFIELD; Our website, WalesOnline, features a powerful tool which enables you to find family members or people who lived in your street who died in World War I. Today, Tom Houghton has searched for fallen servicemen who lived in Amesbury Road, Ilton Road and Blenheim Road in Penylan, Cardiff. Here is who he found.. The bank said it will move its offices from Amesbury, Mass. In two separate transactions, the company acquired Carriagetown Marketplace in Amesbury, Massachusetts and the junior boxes at North Pointe Plaza in Charleston, South Carolina. She volunteered for many organizations, so many, such as Our Neighbor's Table in Amesbury. The Amesbury Property Company has appointed the Birmingham-based property developer to deliver a range of warehouse units on the remaining two serviced sites totalling 16 acres known as EOS. Also found in the Kirkhaugh burial were flint arrowheads, stone metal-working tools and a beaker - all similar to the objects found in 2002 in the grave of the Amesbury Archer near Stonehenge. The local schools benefiting include: Amesbury Elementary, Amesbury High School, Amesbury Middle School, Bresnahan School, Brown School, Cashman Elementary, Newbury Elementary, Newburyport High School, Nock Middle School, Pentucket Elementary School, Pinegrove Elementary School, Salisbury Elementary, and Triton Elementary School. SCIENTISTS have identified Amesbury in Wiltshire as the oldest town in Britain. London, May 2 ( ANI ): UK's oldest town has finally been confirmed to be Amesbury, some 40 miles from Stonehenge. In 2011 after a series of bad winters in which the village was cut off, landlady Shirley Amesbury adapted a pub storeroom and turned it into a village shop to keep villagers going.